LA PALMA, Canary Islands A lifeboat from a British-operated cruise ship fell upside down into the sea at port in Spain's Canary Islands during a safety drill, killing five crew members and injuring three others Sunday, officials said. About 1,400 passengers were on board, but none were involved in the accident. Thomson Cruises confirmed the incident involving the Thomson Majesty ship on the island of La Palma, saying "there have sadly been five crew fatalities and three crew injuries." One of the three injured was discharged from a hospital, and the other two were also expected to be allowed to leave the medical facility. Investigators were trying to determine what caused the lifeboat to plummet into the water. Rescue personnel were called to the dockside at 7:05 a.m. ET after "a lifeboat with occupants had fallen overboard from a cruise ship docked at the pier of Santa Cruz port in La Palma," a regional government statement said. A small, white two-hulled lifeboat could be seen capsized beside the large ship. 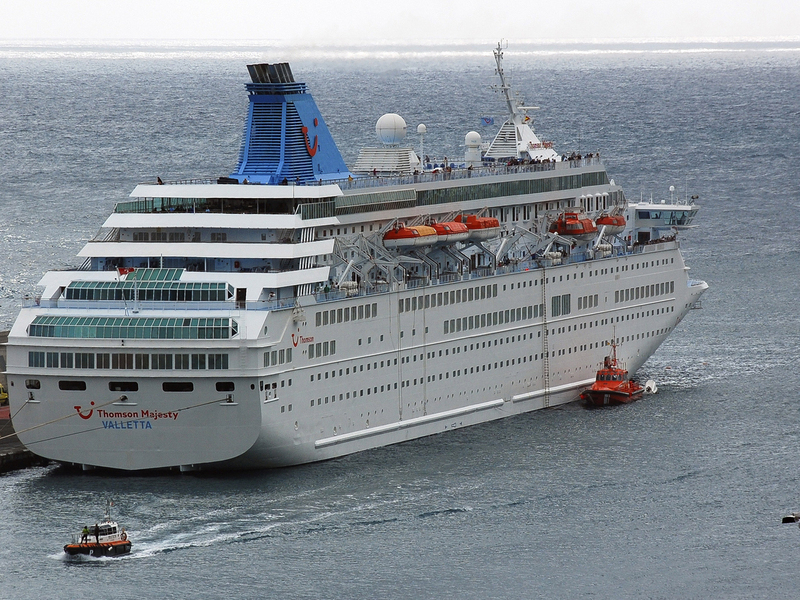 Around 1,400 passengers were aboard at the time of the Thomson Majesty ship, but were not in any way involved in the accident, authorities said. The ship had been due to sail Sunday afternoon to the Portuguese port of Funchal on the mid-Atlantic island of Madeira. Three of the dead were Indonesian men, one was a Filipino man and another was a man from Ghana, authorities said. The injured were all men, two aged 30 and another, a Greek national, was 32. They were taken by ambulance to the general hospital of La Palma. The local authorities of La Palma canceled Carnival festivities that had been due to be held on the island Sunday, but said they would go ahead as planned on Monday.